The American Legion was formed in 1919 for the purpose of helping war veterans secure benefits specific to their needs and finding camaraderie amongst themselves. The Mooresville chapter, Post 103, was formed in 1997 and opened the doors of its current location in 2004. 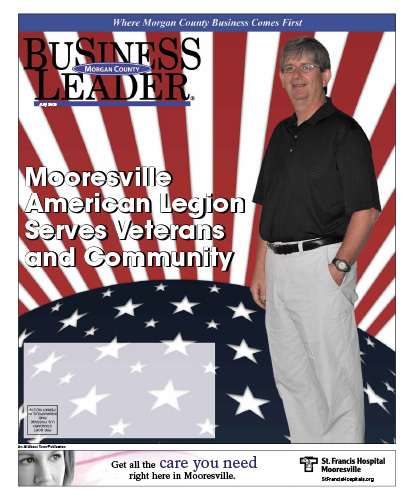 “The [Legion’s] responsibilities have expanded through the decades, and now include support of children’s groups and organizations for the elderly; care for families of veterans and soldiers currently on active duty; participation in a variety of community events; and providing scholarships for local schools,” explained Rod Rushing. Rod was recently re-elected to serve as Judge Advocate for Post 103 and was an active participant during the formation of the Post. Post 103 has 485 members, with veterans from ranging as far back as World War II and including recently discharged soldiers from current conflicts. The Post’s board is made up of 7 to 9 members and various committee volunteers. Download the full July 2009 Edition here.